Rhodes’ cuisine always had a rich variety in flavours. Basic ingredients used in the island’s recipes are wheat and olives thanks to the land’s fertile grounds which facilitate cultivation. Have you been in Rhodes before? Have you tried delicious Rhodian Cuisine (Greek foods) especially at Rhodes restaurants? Which village, destination or restaurant is most famous? Try tasty greek dishes with affordable eating out prices! You will find the restaurants and dishes we recommend in our article below. Though the Greek island Rhodes has much to offers its tourists, one of its best assets is the food. To get a taste of the tastiest offering, we’ve rounded up the 11 best restaurants on the island. Delicious meat, fresh fish and seafood based dishes, as well as a wide variety of desserts made with cereals, olive oil, nuts, fruits, honey and herbs, compose the uniqueness of Rhodes’ cuisine. Rhodes Island is one of the most renown and beloved destinations during spring or summer. Fine cuisine lovers from around the world have the chance to savour local dishes which combine tradition and modern trends in gastronomy. 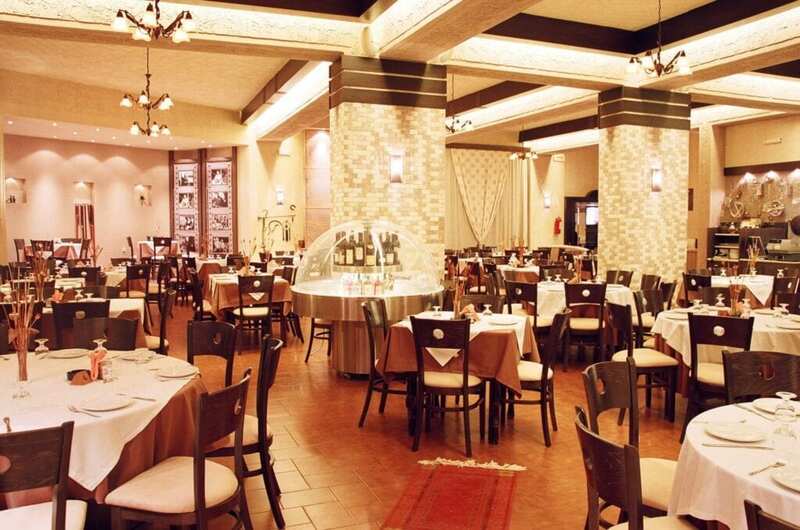 In the Rhodes restaurants where the best examples of Greek cuisine are exhibited, you can enjoy your holiday with the rich Rhodesian cuisine. 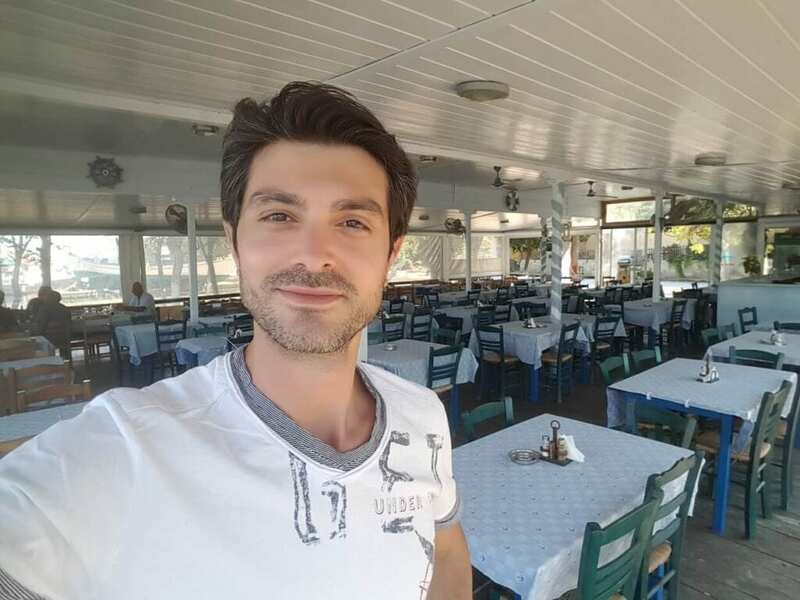 One of the best and name-spread restaurants on the island is Antonis. 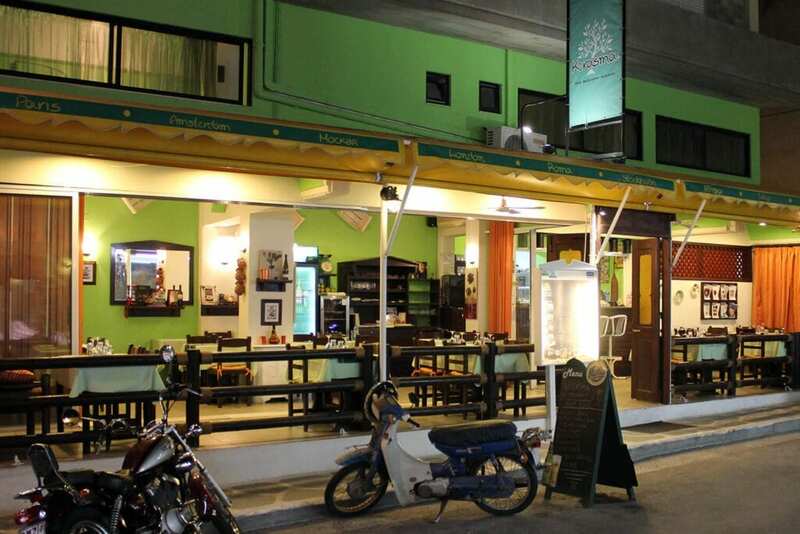 It has quite a nice setting with the original Rhodes cuisine and friendly atmosphere. The Marco Polo Café is situated in the Marco Polo Mansion, a lavish hotel in the heart of the old Turkish Quarter of Rhodes Town. The building itself dates from the 15th century, when the Ottoman Empire was in its prime and the Mansion aims to recreate the richness of this cultural and historical moment with its interior décor. From India to Turkey to the Aegean, there are carpets and drapes here that recall something of imperial glory. The exotic garden features a range of fruit trees, from apricot to banana, alongside beautiful flowering plants. It opens its doors to the public in the evenings giving anyone the opportunity to enjoy an intimate dinner overlooking the Old Town. There is nowhere better than Kyma Beach Restaurant for those who wish to enjoy their evening meal with an unparalleled view of an Aegean sunset. The restaurant is in a beautiful setting, located on the beach itself with uninterrupted vistas over the vast water. As if that weren’t enough, the food here is superb. 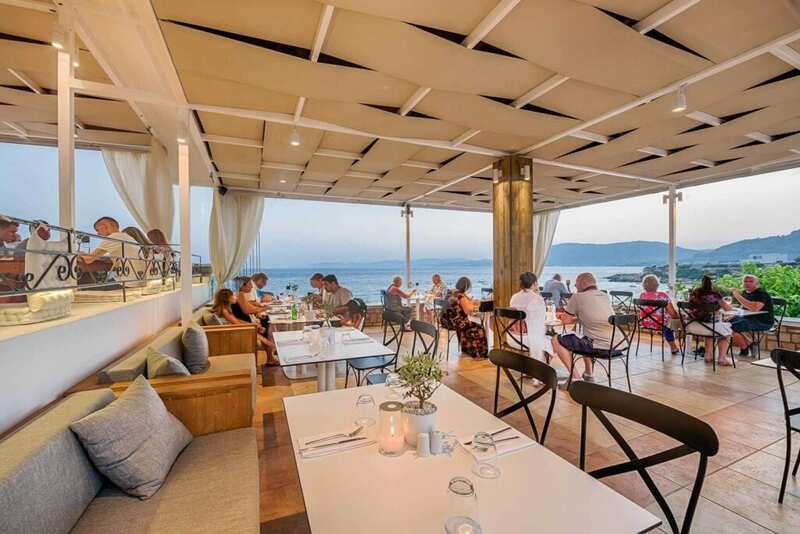 It has traditional Greek dishes and a large range of drinks so that visitors can unwind with cocktails or a cool beer while watching the sun go down. Set at the base of the acropolis at Lindos, Melenos Lindos Hotel has been constructed with an eye to the island’s diverse cultural inheritance. From the villas constructed in the 17th-century style to the rooftop restaurant which draws inspiration from the medieval period with its tented roof and mosaic floor, the hotel is rich with history. The restaurant itself offers stunning views over the Aegean and the two natural harbors at Lindos. Above the restaurant the fortified acropolis is lit up at night. 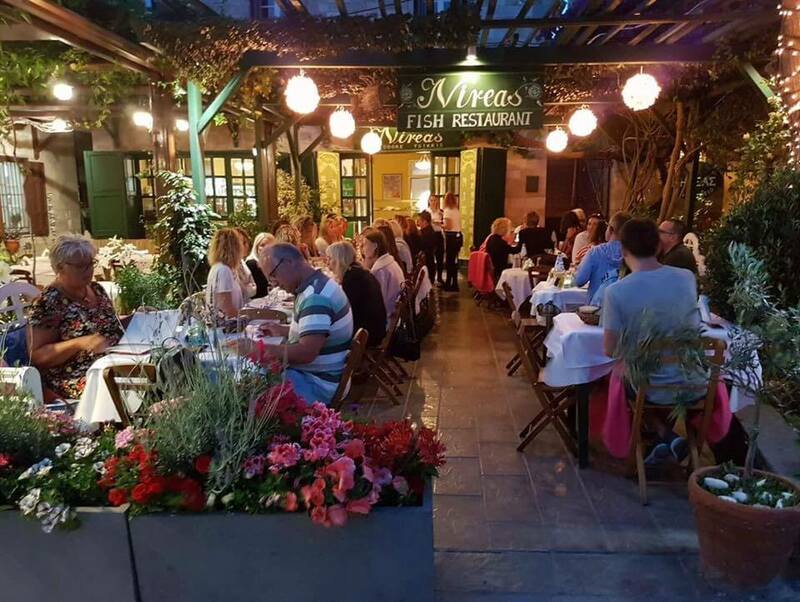 Located in the main square in Lindos, Mavrikos is one of the oldest restaurants in the area and is still run by the Mavrikos family. It regularly wins prizes among Greek restaurants and has become something of an institution over the years. Chef Dimitris Mavrikos is renowned for the elegance and simplicity of his flavors, which have earned him a reputation as Rhodes’s most famous chef. The restaurant itself is designed with a shaded courtyard in the front and further indoor seating. Although among the pricier restaurants on the island, this is the natural result of its popularity. Hatzikelis is a world-class seafood restaurant that has won a number of awards and is frequented by celebrity clientele. 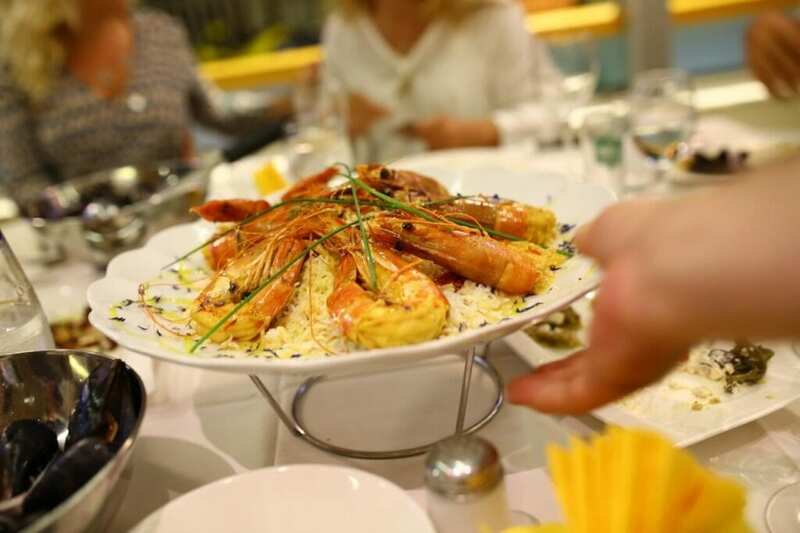 Their signature dishes use classic Greek flavors to enliven traditional seafood recipes, whether it is mussels with tomato sauce and feta cheese or shrimps in ouzo sauce. There is a beautiful outdoor courtyard with views onto the ruined Church of the Virgin, but don’t let that distract you from the quality of the cuisine. 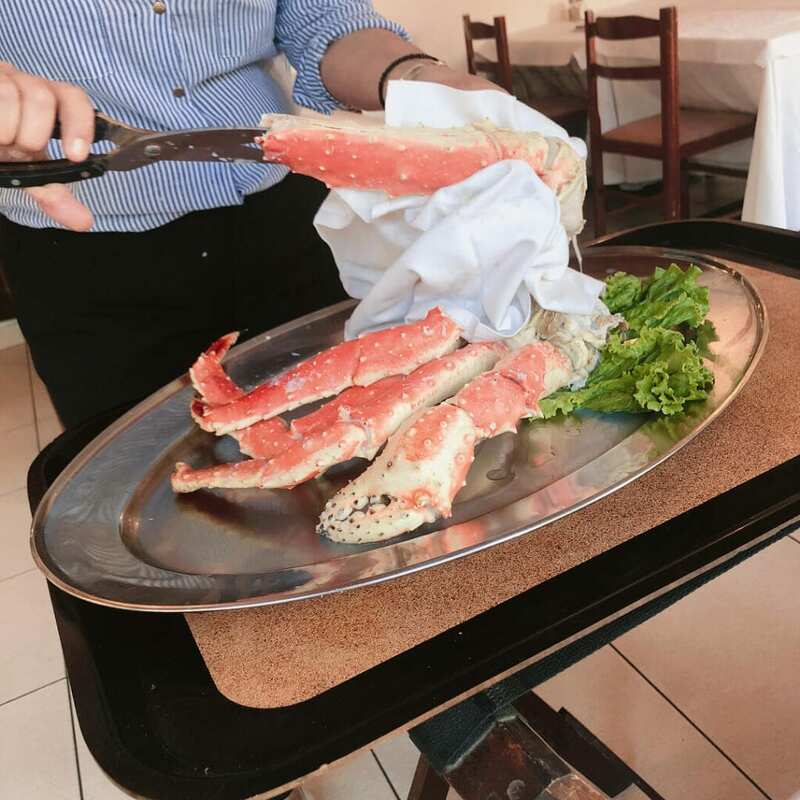 Whether served grilled whole or in a smaller helping, the fish is fantastic and it is this alone that has made Hatzikelis arguably the best seafood restaurant in Rhodes. This modern restaurant only opened in 2010 but has gained in popularity every year. Kerasma prides itself on offering local twists on traditional recipes, infusing each of its dishes with the taste of Rhodes. ‘The Acid Octopus’ is an octopus dish served in a homemade sauce of vinegar and honey, while the salmon is marinated in Raki, the Greek aperitif, and juniper berries. There is fresh grilled fillet of shi drum and Greek chicken, which is crusted with peppers and vegetables and complemented by a feta cheese sauce. For dessert there is a tiramisu made with Greek coffee. Chef Moschonas Antonis, who has visited other European countries to advocate for Grecian ingredients, aims to create a modern experience of traditional Greek cuisine with unusual flavors and subtle tastes that will impress the more adventurous traveller. Arhontiko is set in a house which dates from 1605 and is the preserved house of a ship’s captain. The décor is therefore unusual, making room for an old sea chest and seating guests on cushions as often as seats. The floor is pebbled and the walls whitewashed, leaving the bare stone arches exposed. It is a wonderful taster of the island when it was a thriving port and trading post. As you might expect from a restaurant set in the house of a sea captain, Arhontiko serves fantastic seafood and has won a number of awards. 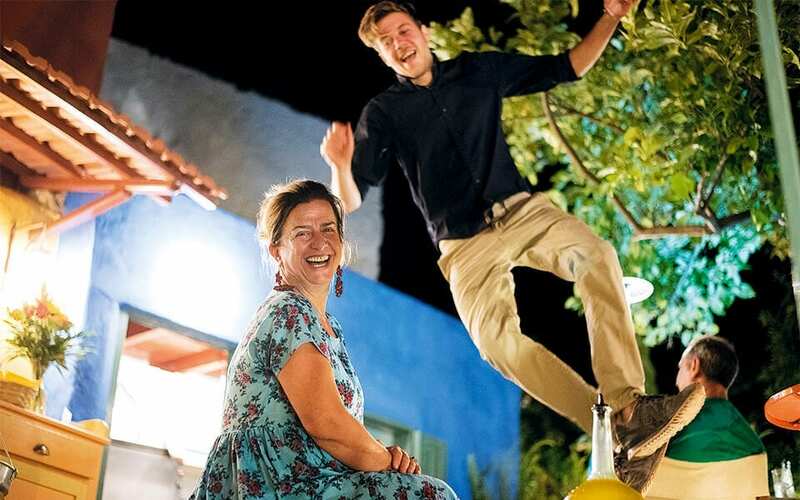 It is locally run by Dimitris and Flora, who are more than welcoming hosts. There is also an outdoor terrace offering views over the acropolis. 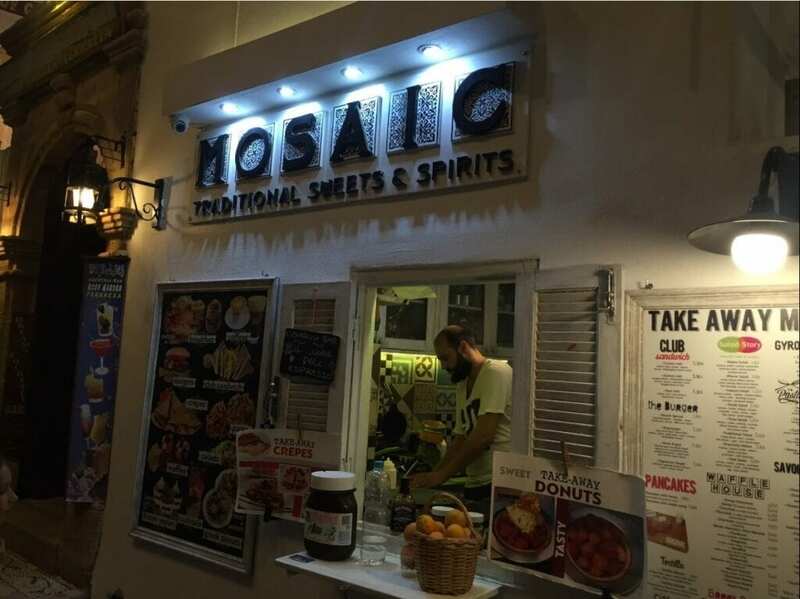 Specializing in sweets and pastries, Mosaic is a cosy cafe-bar beautifully situated in Lindos town. It serves all manner of treats, from Greek doughnuts baked fresh every day, to traditional pastry sweets such as baklava and ravani. Mosaic is also known for its frozen yoghurt, which comes with a various toppings or with a choice of dessert, and its coffee. It is charmingly small, so guests can escape the hustle and bustle of Rhodes. 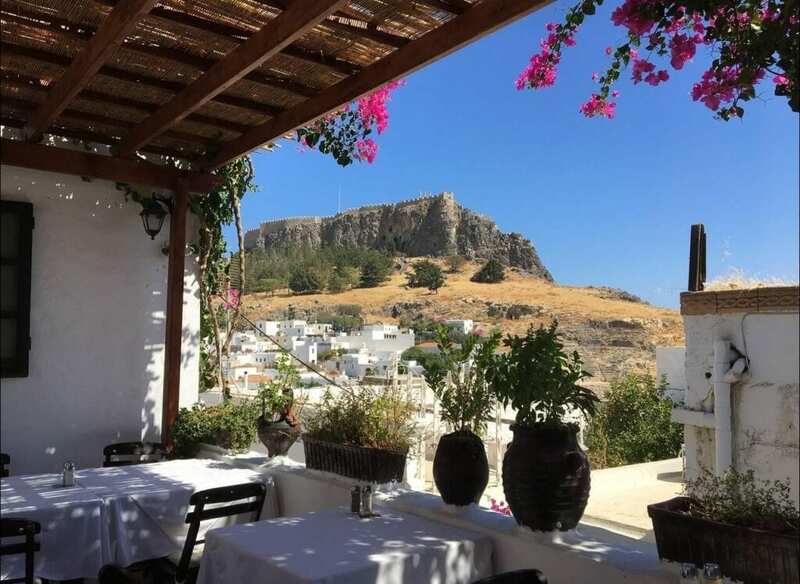 There is further seating upstairs offering marvelous views over the fortified acropolis at Lindos. Mosaic does serve savory food, but it would be a waste to go here without sampling the traditional, sugar-syrup desserts of Greece. Nireas is best known as a fish restaurant, although it in fact serves a whole host of dishes. The fish here, however, is among the best in all Rhodes. Nireas is located in the old Jewish Quarter of Rhodes Town, not far from the waterfront. It is tucked away and covered by a leafy canopy of greenery which shades visitors from the midday sun. The variety of fish ranges from shrimp to squid to seared tuna with sesame seeds. Nireas is highly recommended for its Old Town location, its friendly staff and, most importantly, the quality of its food. Akti Ixia is a combination of cuisines, offering everything from American burgers to lighter tapas to a new sushi bar. 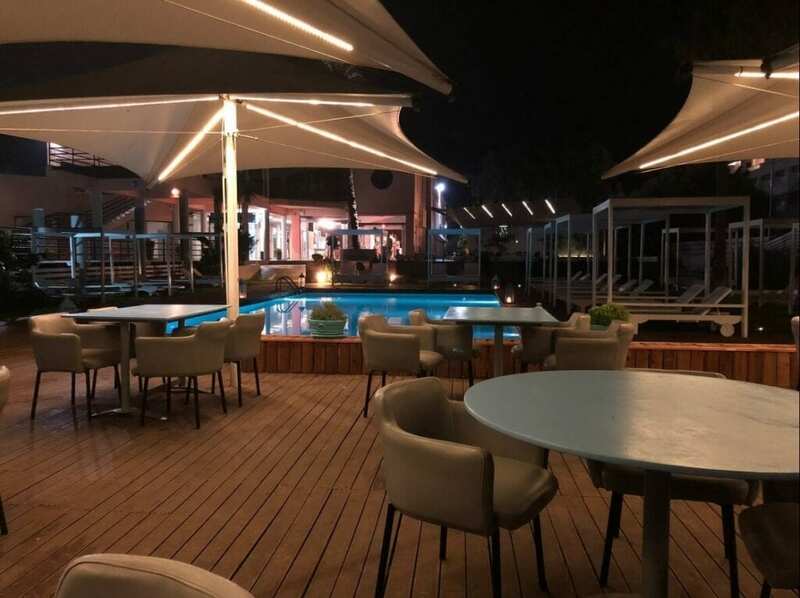 It is not only a restaurant but also a poolside bar located directly on the sea. It is open at all times of day, but particularly beautiful at night when guests can enjoy an evening dip before dinner against the backdrop of an ocean sunset. There is also a wonderful cocktail menu to complement the array of food choices. Akti Ixia is a marvelous location for families as the pool naturally keeps children entertained. For the adults, it is also a sophisticated and secluded seaside restaurant. Finally, don’t forget to try the local Souma (*) drink. It is produced in the village Embonas in the end of September. The grapes are removed from the stem, pressed to extract their juice which is then boiled in large cauldrons and poured into barrels that are placed in a cool place. Souma is best served cold. (*) Souma is a traditional drink and can be different from place to place, some make it out of figs, others out of grapes, in Rhodes you will find Souma made out of Grapes mainly. How to go to Rhodes?